1.) Squiggle Drawing: Draw a squiggle line on a piece of paper. Pass it to someone else. Let them add to the squiggle line to create a picture. 2.) Themed Squiggle Drawing: Draw a squiggle on a piece of paper. Write a theme on the top of the paper (i.e. – farm animal). Pass the paper to someone else and they have to create a farm animal from the squiggle on the paper. Try some Silly Sketches or Doodle Diaries. 3.) Group Shape Picture: Pick one shape (i.e. circles). Hang up a large piece of paper on an easel or the wall. Each person should add one circle to the paper, whatever size and color they wish. Add to it each day to create a nice work of art. Change shapes the next time. Need more shape ideas? Try the I Can Draw Shapes Mini Book. 4.) Drawing to Music: Turn on different types of music and draw while listening. 5.) Simon Says Draw: Just like the active game of Simon Says except the leader calls out phrases like: “Simon says draw a circle”. “Simon says draw a face”. 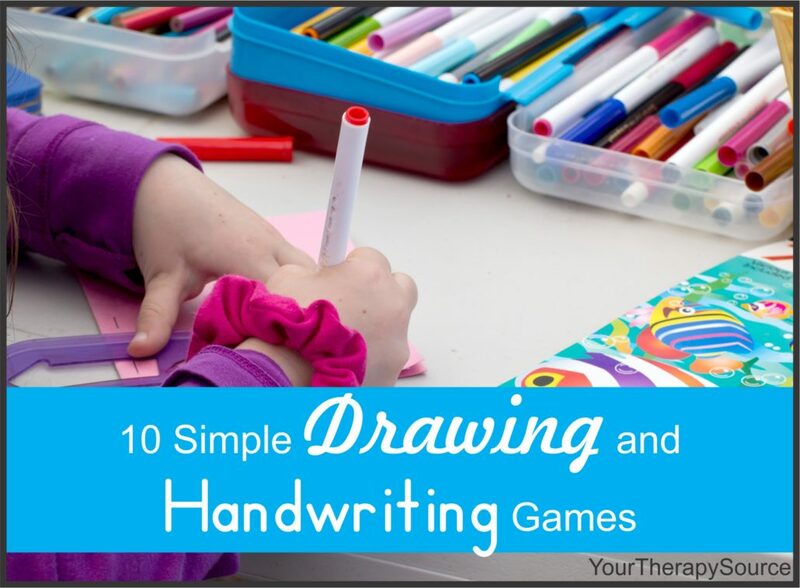 “Draw three lines”, “Write the letter A”…. 6.) Follow the Leader: Put the easel in the front of the room or use a whiteboard. Choose one student to be a leader. That student draws an object. Each student at their seat follows the leader and draws the same object. Keep going and compare everyone’s pictures at the end. 7.) Hot Artwork: Put a piece of paper on a clipboard and put several different writing utensils in the middle of a circle. Have the children sit in a circle. Turn on music and pass the clipboard. When the music stops, the person holding the clipboard draws one object. Turn the music on again and repeat until a picture is created. 8.) Hide the Drawings: Put two children near each other but put up a divider so they can not see each other’s paper. Call out directions such as: draw a house, draw a flower in the yard, draw a bird in the sky, etc. At the end compare the pictures and see if they are similar. For letters you could call out directions such as: write a capital letter ‘A’ in the right corner, write a lowercase ‘b’ in the bottom left corner, etc. 9.) Complete the picture: Using a starting image on a piece of paper, have the child complete the picture. Here are free sample pages from Partner Pictures to download. Try some Dice Drawing. Roll the dice and complete the picture. Here is a sample page to try Dice Drawing. Check out free sample pages from Let’s Hang Out. 10.) Hide and Go Draw/Write: This is played like regular hide and go seek except the person hiding brings a clipboard along. While hiding they must draw a picture or write a word/ phrase. When the seeker finds them, he/she has to guess what was drawn or read the words.